Optimized by default using Google & Litespeed technologies. Datacenters in 5 continents of your choice per WordPress site. Always free migrations by an experienced developer. Technical support from the leading WordPress experts. The fastest WordPress caching plugin and it is improved on our platform. The fastest and most reliable way to serve PHP pages, powered by Litespeed. Dramatically improves the PHP execution time and reduces the MySQL queries. Reliable, resilient, low-latency DNS serving from Google’s worldwide network. Reducing the connection time by using Google next-generation protocol available at the origin servers and CDN. GZIP is good, but Brotli is just better for reducing assets size. Closte.com website is self-hosted in the us-central region but powered by our distributed cache. Accessing from New York, London or Sydney, the load time is the ~same. Access your environment via SSH or access the files via SFTP. Build software better, together with your teammates. 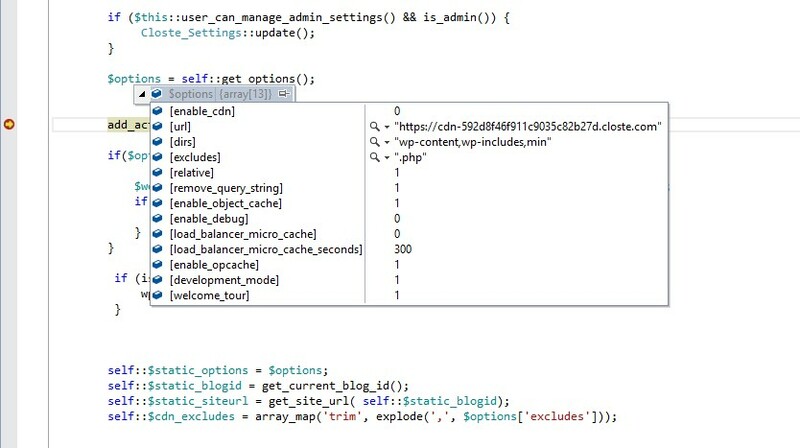 Choose the site PHP version or change some PHP runtime variables. Don`t get lost analyzing the logs files, use a web-based log viewer. Web-based database administration tools and local tunneling. Manage WordPress from the command-line without using a web browser. 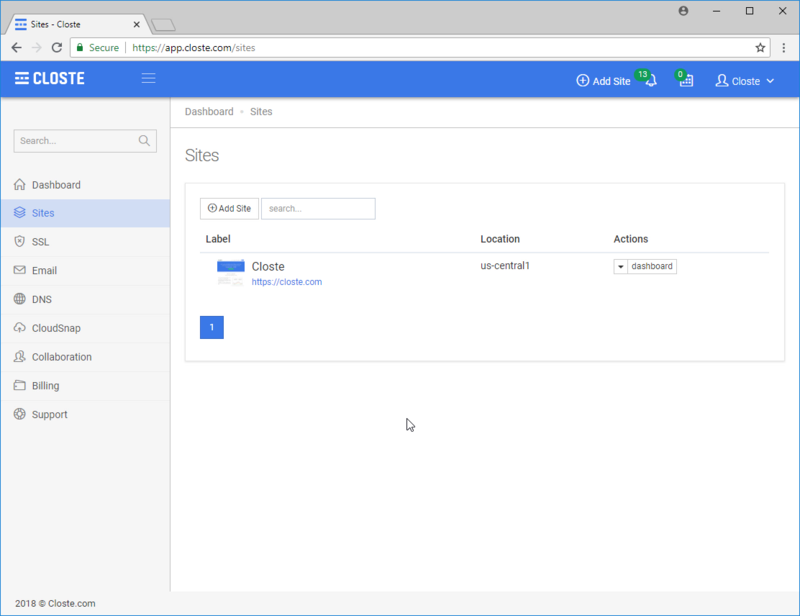 A staging site is a clone of your live website, temporarily hosted on Closte subdomain and enables you to test any changes or new features that you plan to implement in a secure environment. 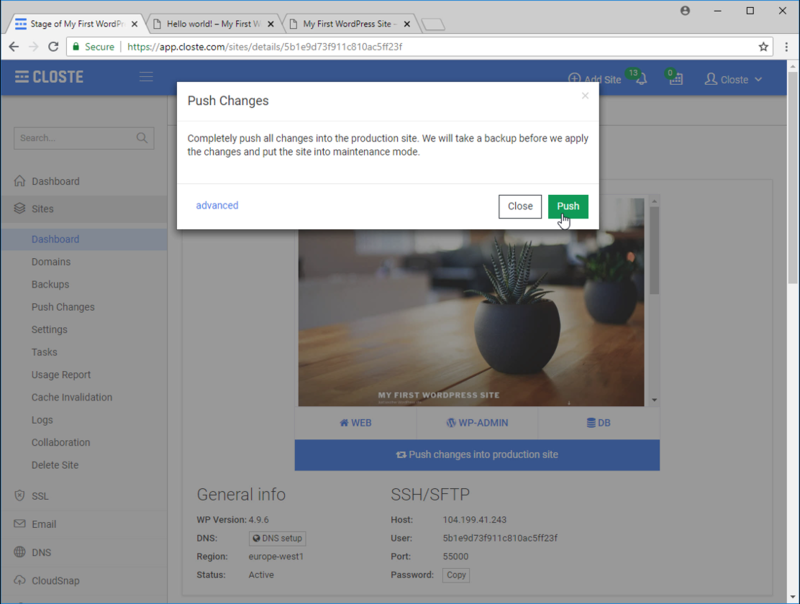 You can use the staging environment as a testing ground in order to prevent errors occurring on ‘live’ websites and have the ability to apply all the changes to the production site with just one click. It`s fully featured, just like the production site including CDN and Backups. It cannot be crawled by the robots regardless of your robots.txt file or you can even completely protect it. When working on the staging site, the emails sent from WordPress are delivered to your private email address. Push only single or multiple files, just the database or just a database table. 100GB, 200GB site? Create a staging site only from the files accessed in last 7 days. still using ‘var_dump()’ for debugging? You can debug a live website directly from your local development IDE. That`s what we do when we are developing our Closte plugin. developer, agency or large team? Clone WordPress with your new domain in the same or another region. Live preview of a backup point or check how something was configured. Transfer a site to another geographic region fully automated. Never share passwords, but share a website, DNS, email or SSL entity. Save time when whipping up new WordPress sites by using pre-made templates. Transfer the site to your client but still have the access like is your site. Closte is a ‘closed network’ platform allowing only humans at a normal rate. Web Application Firewall tuned for WordPress that blocks over 2M requests every 24 hours. High efficient real-time malware detection protection tuned for WordPress. The basics: Works automatically – no additional set-up required. Request & install free wildcard SSL and forget about browser SSL warnings. Custom domains added by your clients are automatically added at the server level. Every WP Ultimo website has increased power quota. Once your client updates the DNS records, our system will install an SSL certificate automatically. Your clients can check the DNS requirements within WordPress, just like in Site->Domains. We give you a complete overview of every billable parameter and these charts can help you understand or improve your site just like we find it in one of our blog post or how we find badly coded WordPress plugins. And yes, even our unique visitor’s statistics are different. Others are excluding all well-known robots but including all unknown robots as unique visitors or requests who just accessed a file e.g Hotlinking. Here is Closte definition of unique visitor: An unique IP address in 24 hours, accessing a page generated from WordPress using a human browser whatever it is Chrome or Dolphin Browser for Android.